I've grown up behind the scenes of a successful lesson and boarding facility. Learning not only about taking care of horses but taking care of a farm and the people that make it all possible. I have been so fortunate to have the opportunities to own, show and care for some wonderful horses so far in my life. At 17, I'm running out of time to represent Area 8 in the 1* at NAJYRC and I have my sights set on Young Riders in 2016. This year is going to be hectic and full of new experiences as I come back from a nasty injury, compete my hopeful UL mount Reba, keep bringing along my young horses and pick up our farm and move locations. I'm so excited to see what this year is going to bring and all the new places it will hopefully take me. We’re all trying. 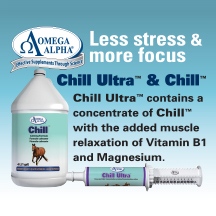 We’re trying to care for your horses to the best of our abilities, make you happy while also trying to make a living. Do you know how difficult it is? To wake up before the sun rises every morning to take care of horses we don’t own for little to no recognition or gratitude? To always put your happiness and your horses well being before our sleep or clean house? Don’t get me wrong, we love it. We love getting to bond with your horses and seeing them mature. We love being able to build a relationship with you. We want to be apart of your life in a good way. 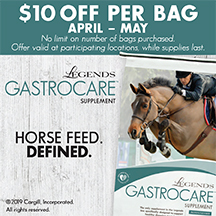 We want you to trust us with the care of your horses, because we care. It’s hard though. When you don’t come to see your own horses for weeks at a time, even though we are here everyday. Sometimes I wonder if we have a stronger connection with them now. In some cases we do. 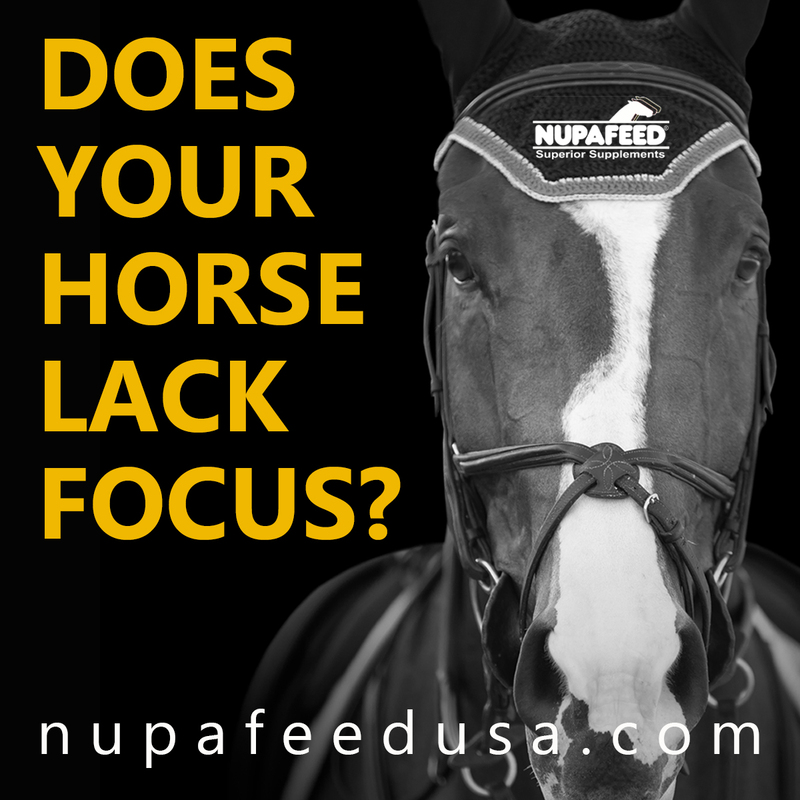 We get that you each have very different, busy lives and can’t always make it out but you have to remember your horse depends on you. They want to see you because they are bonded to you. Sure, they know we feed them, but they also know you own them– not us. Please try to do right by them. We are friends. It may not be the most professional move, to make friends with clients but it’s inevitable. We spend countless hours with you and your horse and have countless conversations with each other, at some point we formed a friendship. We speak the same language and home is the barn for us all. When you move out, it hurts us more than it appears to. You take a piece of our hearts with you when you leave. Most of the time you say hurtful things when you go, that too hurts us. We’ve tried our hardest and you just disregard every sacrifice we have had to endure. We go nights with little sleep and days with hard labor to ensure the well being of your animal. Please don’t give up on us but if for some reason you do, be respectful. We are thankful for you, although we get frustrated and have to get on your case sometimes, we wouldn’t be living our dream without you. We are thankful for your business, for your emotional support when we’re going through a hard time. We are thankful for your loyalty and your willingness to pitch in when one of us has pneumonia. 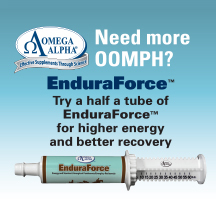 I couldn’t have my horses and compete if it wasn’t for you wll. So thank you, from the bottom of my heart, for enabling me to do what I love most. When you move your horse not only does it hurt us personally, it hurts us financially. I know you may not take that side of things into consideration but when you leave we are losing money needed to pay our bills and take care of our families. Your $300 may not be a big deal to you, but to us its the difference between keeping our electric on or using candles in the bathroom to shower. Paying before the first of the month may seem unnecessary to you, but we have bills that are due also. When you don’t pay on time, you make us late on our payments. Please, be mindful of what you’re going to effect on our end of things. Our barn is our pride and joy. Chances are the owner of your farm has put a lot of time, money and effort into making the barn as clean and inviting as possible. When you don’t sweep up after yourselves you’re disrespecting our hard work. You wouldn’t go to someone else’s house, break a glass and just leave it on the floor, would you? So why do you think its okay to leave your horses poop in the washrack or his hoof dirt in the isle? Please clean up after yourself and help us keep the barn a clean and safe place for everyone involved. People spread rumors. Boarders come and go like a revolving door sometimes. That’s the business though. People leave unhappy with how much sawdust is in a stall and start spreading rumors that you starve horses or neglect them. These people left on a bad note and feel it their personal responsibility to try and ruin everything we work to build. Don’t believe those people. If we didn’t care for the horses we wouldn’t have a boarding facility. We want to build something so very special– a legacy perhaps. Don’t make assumptions after hearing rumors from people who couldn’t afford our services. Make sure you always pick the boarding option you can afford and understand what all is entailed. Please don’t knock us ’til you try us. We love you. We love each and everyone of you, past, future and present. We will always be here for you, through weddings and break ups, to graduations and the losses of your best horsey friends. You can always count on us. And to the boarders who have come and gone: you have been my very bestfriends and have given me some of my favorite memories. You all taught me so much about love, life and eventually forgiveness. I miss you all and will always hold you and your horses in my heart. In the end, every barn owner around the world is working for you. We’re working to give you the best of everything we possibly can. But, it takes time. Rome wasn’t built in a day, and neither was a perfect farm. Bare with us, for we will share our world with you and will cherish your horses just as much as you do. 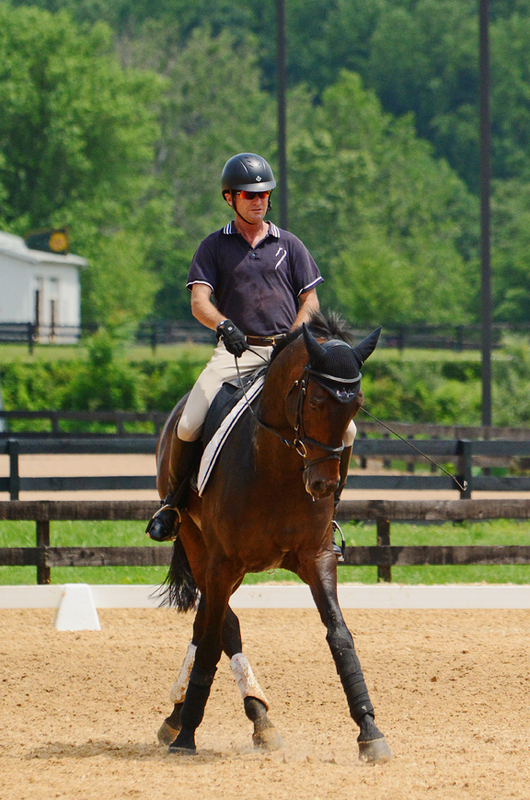 Phillip Dutton and Fernhill Cubalawn in their lesson with David O'Connor at Morningside. Photo by Jenni Autry. During our first meeting with Robin Walker and Cathy Wieschhoff during Area VIII Young Rider Camp – South they began preaching the phrase, “Become a student of the sport.” Honestly at first I didn’t know what they meant. I am a student of the sport, aren’t I? I mean, I train with Cathy on a regular basis, I am her student – therefore I’m a student of the sport, right? Wrong. Maybe not completely wrong because I am correct, I’ve been her student for almost two years. However not until recently have I become a student of eventing itself. I’ve never enjoyed reading horse books or articles, and heaven forbid you convince me of the benefits of documenting my lessons in, oh dear, a notebook. I mean honestly, what’s the point? Well, the point is remembering and practicing it correctly. You’re never actually remembering a complete memory itself; you’re remembering the last time you remembered it. Which means every time you will leave things out and change things slightly until eventually it’s not a complete accurate memory anymore. So, by writing down what occurred in your lesson DIRECTLY after, you can remember everything as accurately as possible by referring to your notes. It’s actually a fool proof way of doing your homework the way you practiced with your trainer. That’s one very effective start to becoming a student of the sport, but what are some others? In this day and age we have endless amounts of tips and insight from top professionals at our fingertips. 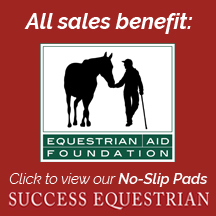 We have Eventing Nation, The Chronicle of the Horse, Horse Collaboration, Evention TV, The Heelsdown Magazine, EventingUSA, and many other wealths of knowledge that are accessible to EVERYONE. 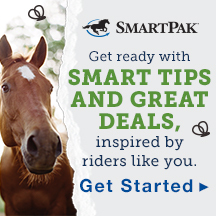 You can go on USEF Network and watch hours of clinic footage and endless videos of our top riders in the world. You’d be surprised how much you can learn just from watching our nation’s best riders do some dressage tests. 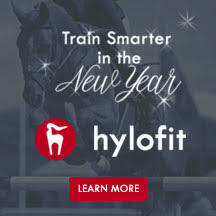 You can also read about exercises and things people like George Morris and Lainey Ashker do with their horses at home and how you can do the same exact exercises. Learn to be a sponge and never stop soaking up information. 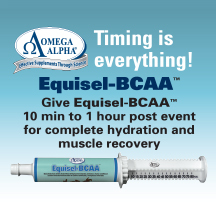 Expanding your tool box is a huge part of training yourself and your horses. Clinics and lessons with anyone you can get to will help with that. 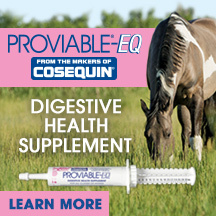 Almost every horse person has at least one thing they can pass on to you which you might need sometime down the road. So if you’re ever in a lesson and the trainer tells you to become a student of the sport, you may have a better idea of what they mean. We never stop learning but it’s important you never take something you’re being taught for granted. We have trainers for a reason, and they have already done their homework and continue to learn. No one can make you want to learn more about this sport — you have to want it for yourself. So go out there and take advantage of some opportunities – maybe even invest in a notebook. Photo courtesy of Photography by Wanda. You buy a horse, you imagine your future together, all the things you’re going to accomplish and all the memories you’re going to make. 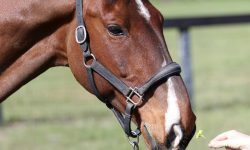 You spend all your extra time with them, buy them blankets, halters and everything else with their name on them. You start living your dream with that horse. You compete, play, do photoshoots and somewhere along the line you fall in love. You can’t imagine your life without that horse or how you ever lived before they came into your life. Time flies by, years of love and care go into this horse that you love with your soul. Then one day, they’re just gone. The hole left in your life is indescribably large. You swear nothing has ever hurt so badly, but at the same time they finally aren’t hurting. Moving on seems impossible. How are you supposed to be able to let go? Do people think you can just forget everything? Why does everyone think this is so easy? You just want everyone to give you time to grieve, a piece of your heart is gone. Don’t you at least deserve some time and space? I recently had to put down a horse that once upon a time was going to be my upper level horse. Ironically enough, when I first started my horse search, this was the first horse I was supposed to look at but he had been shipped to New York on a trial. So I skipped him, and looked at a ton of other horses. Then one day, we got a call saying the horse was back and they asked if I was still interested. Ramsey was 5 years old when he came to my farm and never left. He came off the trailer so lathered in sweat, it looked like he had just been soaped up for a bath. Poor thing was so nervous, I was sure this was going to be a disaster. I don’t know what we were thinking, honestly. I was only 14, this wasn’t the horse I needed at the time. But, we fit together and I was hooked. This huge bay Thoroughbred, that never raced a day in his life, was the most athletic horse I had ever sat on. He wasn’t extremely fancy, he probably could have been but he always had an extreme amount of energy pinned up inside of him. That translated into choppiness and lots of broncing around. It was evident that we belonged to eachother. He hated most other people, especially my mom. He would charge her, bite her, one day he hit her in the back with his front leg while she was trying to clip him. He always hated blankets too. When anyone would try to buckle the hind leg straps he would threaten to kick. He always let me do it though. Don’t get me started on baths! He was so bad for baths that my mom repeatedly tied him to the fence and stood a good 20 feet away to spray him off. He was an angry little thing, unless it was me. He loved me, I always knew that. That’s why I wanted to be there when we put him down. This horse looked to me for everything, he was my best friend and nothing could change that. Not the rearing, the bucking or the disappointing shows. When he got hurt two years ago, all my dreams were crushed. We were told that he wouldn’t be an upper level horse, and due to his conformation he probably would keep tearing the ligament thus never being completely sound for extended periods of time. They advised us to put him down then, to make it easier for all of us. That way he wouldn’t have to live uncomfortably and he wouldn’t put anyone else in danger with his anger issues. But I had hope. I held out hope for as long as I could but everytime he seemed sound, it wouldn’t last long enough to keep him in work and he was so naughty. We put him down because of all of these things. Because when we tried to trailer him to the new farm he almost broke his neck and punctured his hind leg. Because McCoys Trademark was a one person horse and he turned on me that day. I’ve cried. More tears than I’ve ever shed and I continue to cry two weeks later. I feel like I did the right thing, I made the right choice with his best interest at heart. I feel him everywhere, now he can come to all the shows he was missing out on. 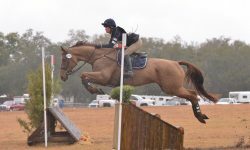 I feel him while I hack my little pony around the new farm, while I’m watching cross country at Midsouth. He’s probably running around the courses like the machine he was. Man do I miss him like crazy too. He taught me so much about myself, about love and now loss. I’ll carry him with me forever. I hope you’re loving it up there big guy, you are the stars in my night sky. Anna Conley and Reba’s Song MF. Photo by JJ Sillman Photography. 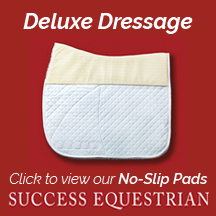 Dressage is arguably the most meticulous, detail-oriented phase of eventing. It’s often referred to as the most difficult part or the most disliked. 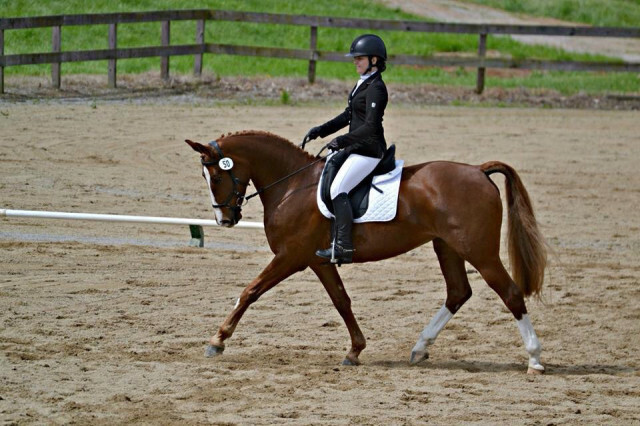 It really takes a perfectionist to appreciate the finer things in life such as dressage. I can admit (as I’m sure many others agree), lower level dressage is like watching paint dry or grass grow or cement sit. I’m not sure how the judges are able to endure one 20 meter circle after another ALL DAY LONG; it’s exhausting, really. Luckily for me *insert sarcasm here*, I have been blessed with the opportunity to only show Beginner Novice and Novice on eight different horses for the past five years. No, seriously, I could probably ride a lower level cross country course with my eyes closed at this point. I haven’t always had a reliable, good scoring horse as I do now, though. 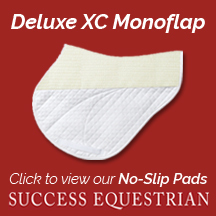 A lot of work has gone into getting consistently low dressage scores. I was just looking through my competition record. In 2012 I was competing my Thoroughbred, Ramsey, and we were consistently scoring in the high 40s. Much to my dismay, we never placed well. After years of working with a classical dressage trainer, I’m now able to ride an accurate, consistent dressage test on my mare that normally lands us in the 20s. 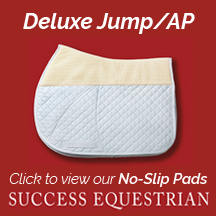 I never knew what it was like to come out of dressage happy and looking forward to the next dressage ride on my horse. 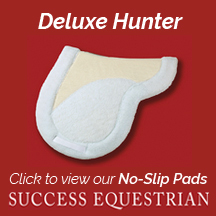 In my opinion a big, I’m talking MAJOR, part in having good dressage is your confidence level. If you go around with your hands low and looking down the whole time while managing to slouch like the Hunchback of Notre Dame, you’re not going to score well. 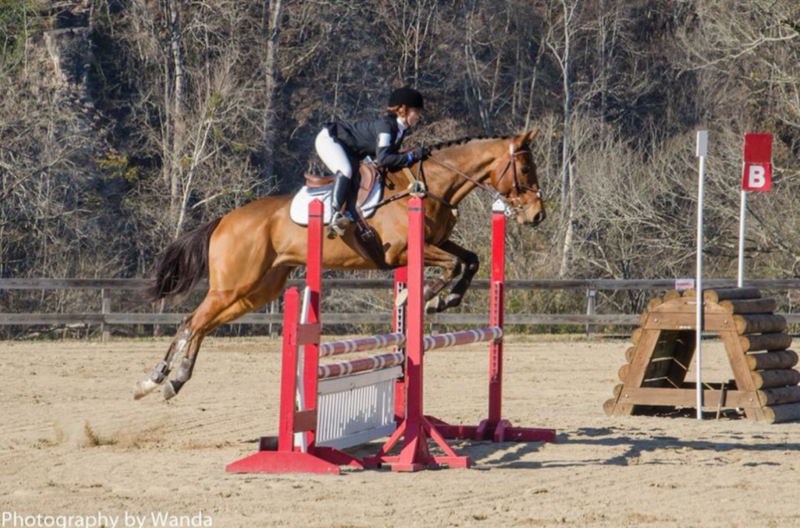 Not only is that poor equitation and completely incorrect, it looks like you’re trying to hide from the world. You can’t show off your horse like it deserves if you’re riding in the fetal position. 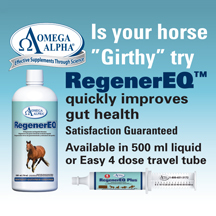 My wonderful dressage trainer, Ellen Murphy, has instilled in me the importance of presenting your horse confidently. Heck, even if you’re not that confident you can fake it; it’s a three-minute test, for pete’s sake. The difference you will notice when you quit hiding and present your horse to the world is amazing. You can OWN a dressage warm-up like nobody’s business if you look up, with a straight back, smiling, with your hands lifted. 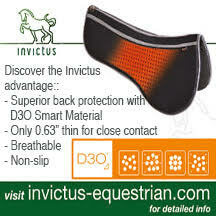 I can promise you that you will resemble an angel sent down from dressage heaven. Now you all know my secret. Unfold yourselves and stop hiding from the judge, the competitors and the scores. Own the ring like Beyoncé owns the stage. You CAN do it, you CAN improve, you CAN be the queen of fancy-ness. Ride it like you stole it, people, and never slouch ever again. Photo courtesy of Anna Kate Conley. I’ve found at this age, I (and pretty much everyone in the Junior divisions) get caught up in the ribbons, scores and results of the shows more than we care about the experience and people we meet along the way. Everyone loves to win. We all love doing well. No one goes to a show thinking, “Oh I hope Johnny and I don’t get a ribbon this time.” Yes, it may be a .30 cent ribbon. 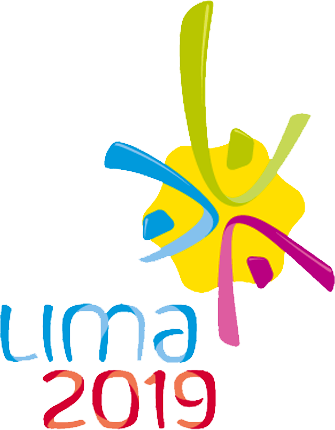 Yes, we may spend hundreds of dollars competing for one of those .30 cent ribbons, but we want one anyway. I think, in some weird, twisted way it gives us a sense of self-worth. A ribbon signifies your training is working and you’re on the right path to success. However, it can’t always be about the ribbons or doing better than someone else. It took me a long time to figure out you could be friends with someone you’re competing with. It’s OKAY to lose to your friend and it’s OKAY to beat them too. Here is where maturity comes into play; you should be able to go in the ring like competitors and walk back to the barn like best friends. I always just watched them from afar, because, lets be honest, in my eyes they were perfect and “the ones to beat.” Fast forward to spring River Glen 2015. 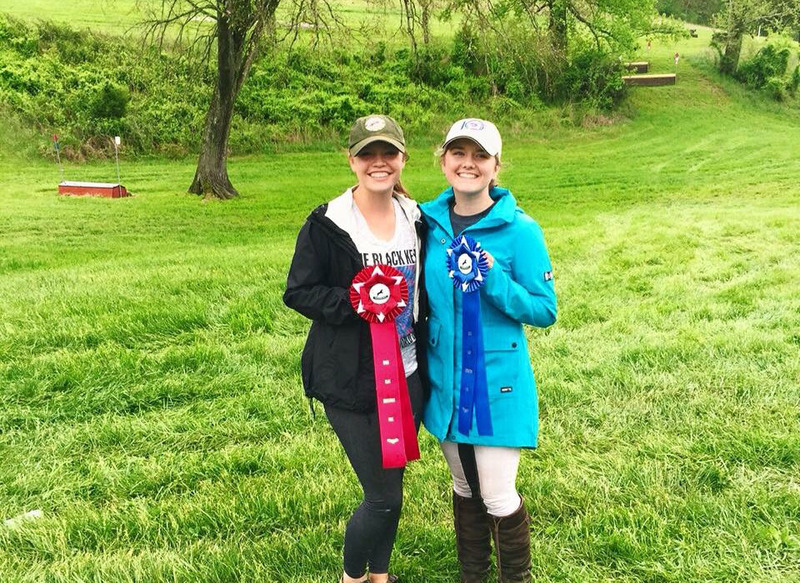 After two years of not being in the same division (I was going BN/N, she moved on to Training/Prelim), we had finally been put together in the same Training division. Initially I was worried, I’ve cheered them on as they rocked around Prelim, so I just knew there was no way I stood a chance against them at my first Training back. I actually told Rachel this and we laughed about it the whole weekend. I ended in first and she got second. It was honestly a perfect way to start my season and I was SO proud of her and Skip. Before we said our farewells we made a kind of pact, if you will. We jokingly agreed since I had won that weekend, she would win the next time we were competeing together, then just go back and forth. This weekend at MayDaze, we were both in Jr. Training. We saw eachother in warm up for all 3 phases, we chatted, we laughed and we wished eachother good luck. When we met up in stadium warm up we were both equally excited because she beat my dressage score by .2 — she had a 31.4, I had a 31.6. Rachel sat in 1st in Training A, I sat in 2nd in Training B. 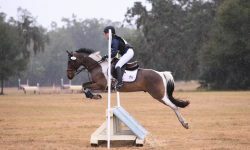 She went clear around stadium, I had a rail, she had a stop on cross-country, I went clean. But, she was the first one to congratulate me when I came through the finish flags. Sunday morning we hacked Reba and Skip together for over an hour just chatting away; we may be good competitors but were better friends. As the pressure to qualify for Young Riders increases, I’m learning just how important it is to find the healthy balance of competitiveness and friendliness. At the end of the day we’re all just taking part in the sport we love. Realizing the support you give and receive can make or break you is so vital for your success. You’re nothing without people who believe in you, and being able to stay friends with someone even though you take turns beating eachother is such a cool thing. I love Rachel and Skip; the friendship we’ve created through competition is something everyone deserves to experience. It can’t always be about the ribbons and beating people you know (or don’t know). One day I’m not going to have all these ribbons, but I’m going to have the memory of Rachel and I hacking the property line of the Kentucky Horse Park. If you’re a young rider and you go to a show only caring about the ribbons, make friends with someone. Whether it be the person stalled next to you, or the girl winning your division, INTRODUCE YOURSELF. Be able to joke around about who’s doing better than who, but always be supportive when things don’t go as planned, you will be better for it in the end. After all, what do you have to lose? 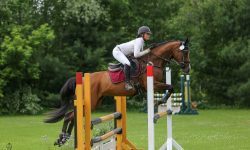 Anna Conley is a 17-year-old eventer who is trying to make it to NAJYRC next summer. Her parents run a boarding facility in Lexington, Kentucky, and these are her not so secret confessions of life as a young eventer. Anna and her family. Photo by Alexis Snowden. In some ways I’m living every horse crazy little girl’s dream. I wake up in a bedroom full of horseshow ribbons, I tuck my shirt into my breeches, I wear my Dubarrys and I go to the barn. (Yes, I brush my hair and teeth too, what do you think I am, an animal?). 1. You don’t have to like everyone. At the end of the day, money is money, no matter who’s bank account it comes from. This is my mom’s job, it’s how we pay our bills, it’s how my mom provides for us and supports our dreams. When you get one of those crazy, common sense lacking horse people that somehow work every nerve you have, you just have to deal with it. Smile when you see them and rant when you get in the car to go home. 2. Every day is a long day. I’m in a completely different situation than a boarder; they can come at any time during the day, do their business, leave and still have time to do normal people things. When I have all my responsibilities squared away by 5 o’clock and I want to go spend time away from the barn, I still have to stay there. My mom has lessons, and the full care horses need to be taken care of for the night. 3. I am the help. It never really hit me that I was considered the help until one of the 8-year-olds that had a pony on full care thought it was acceptable to walk up to me and lecture me for not having their stall cleaned yet. As much as I wanted to hand that kid a pitchfork and tell them they are perfectly capable of cleaning it themselves, I had to comply because it’s my job. Because I’M the owners daughter and that kid’s mommy or daddy is paying for my horse’s new shoes. 4. Don’t get too close to the new girl. It happens every time. My mom gets a new boarder that just happens to be close to my age. She rides. She wants to compete. She’s nice, seems to be dedicated. We meet and normally we hit it off, we start competing together, then hanging out outside of the barn. We quickly become really good friends and the barn is a happy, fun place to be. Then, one day, it all changes. Their parents get mad or something else happens, so they move out. I’ve learned that everybody leaves, whether this all happens over a couple months or you’ve had the best four years of being best friends. They can walk away like it’s nothing, and I’m stuck looking at the spot where their tack box sat, heartbroken because apparently we weren’t as good of friends as I thought. This is the hardest part of being the barn owner’s daughter. 5. Barn moms give great advice and hugs. If I’m having a hard time and need guidance, a barn mom is usually my go-to person. They treat me like their own and tell the best stories, which hold important lessons that I can learn from. If you have a good barn mom, you know what I’m talking about. 6. Jealousy is inevitable and surprisingly common. Jealousy goes around our barn all of the time. People think my mom gives me and my sister extra special attention that she doesn’t give to her students. In actuality, she has to separate being their trainer and being our mom. I’ve noticed parents get jealous for their kids too. Over the years we’ve had so many people get upset because my sister and I have done better than their kid at a show, or I have a nicer horse than them or nicer tack. What those parents don’t realize is it’s not even a fair comparison. My sister, Alex, and I are at the barn every day, we work, we ride and we earn what we have. 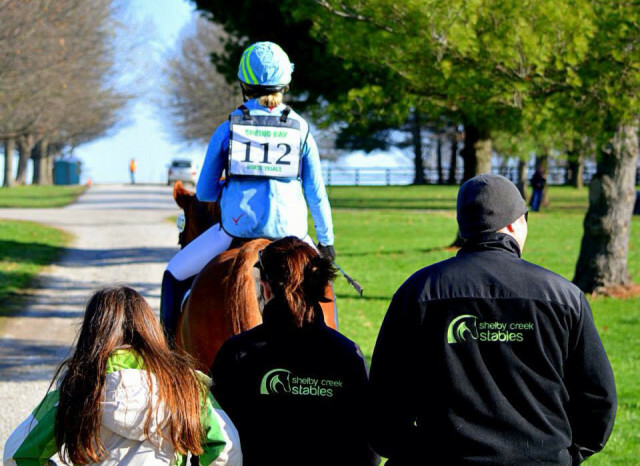 A kid that rides once or twice a week isn’t going to ride as well as someone who rides multiple horses every day. That’s just the way it is. 7. I have to set the example. One of my favorite things to hear is “I want to ride like Anna one day!”.I love that we have so many little children that look up to me as a rider and just as a person. One of my sponsors tells me all the time, “I hope my daughter grows up to be like you.” That is such a huge compliment. I really strive to be mature, hard working, dedicated, humble, polite and responsible. I have kids that look to me for guidance and inspiration; I have to be the person those kids see me as. 8. 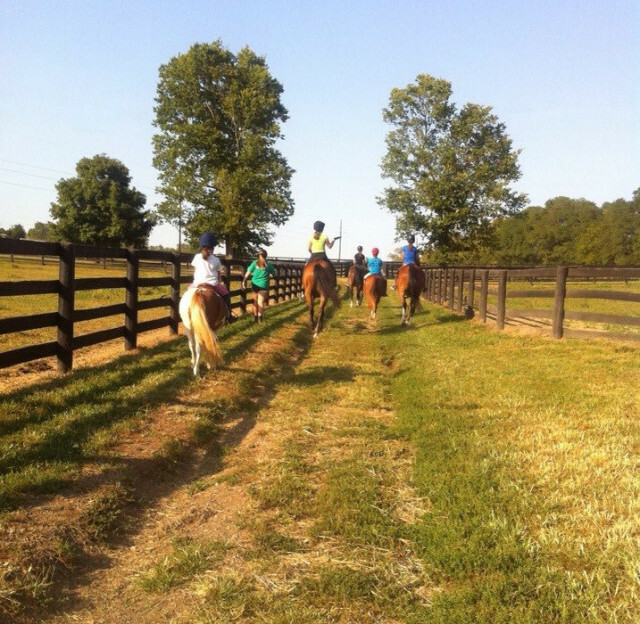 There’s nothing more gratifying than seeing a sale horse in a happy, new home. One of my favorite things I’ve learned from being the barn owner’s daughter is that every horse is for sale, and there’s nothing more gratifying than when you see those said horses thriving in their new home with their new families. It hurts like hell when you really fall in love with one, but if I kept all the horses I fell in love with, I would need my own farm! The most important lesson of all is the barn is where I belong. It’s my safe haven. The barn has seen more of my blood, sweat and tears than anywhere else, and when I’m at the barn, I know I’m home. Being the barn owner’s daughter has its perks, but it also has its downsides. Sometimes I look at other people my age and all I see is what I’m missing out on: proms, football games, bonfires. Then I look at Reba, and I see what all those kids are missing out on; that’s when I know I got the better end of the deal.